Make yourself at home in one of the air-conditioned rooms featuring refrigerators. Wireless Internet access (surcharge) is available to keep you connected. Bathrooms have shower/tub combinations and hair dryers. Conveniences include safes and desks, and you can also request rollaway/extra beds (surcharge). With a stay at Eco Park Lodge in Centurion (Zwartkop), you'll be within a 10-minute drive of Centurion Mall and SuperSport Park. This 4-star guesthouse is 12.4 mi (19.9 km) from Mall of Africa and 12.4 mi (20 km) from UNISA. Practice your swing on the golf course and enjoy other recreational amenities, such as an outdoor tennis court. 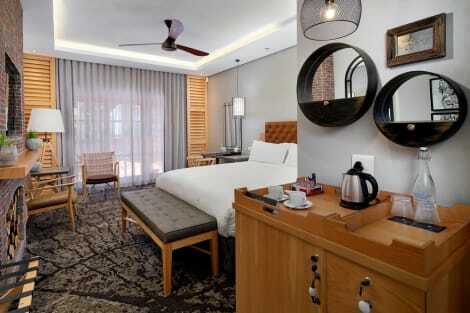 Additional features at this guesthouse include complimentary wireless Internet access and concierge services. Guests can catch a ride to nearby destinations on the area shuttle (surcharge). With a stay at Ambrosia Guest House and Spa in Centurion (Die Hoewes), you'll be within a 15-minute drive of UNISA and SuperSport Park. This guesthouse is 9 mi (14.5 km) from University of Pretoria and 1.4 mi (2.3 km) from Centurion Mall. Enjoy recreational amenities such as a fitness center and a seasonal outdoor pool. Additional features at this hotel include wireless Internet access (surcharge), concierge services, and babysitting/childcare (surcharge). Getting to nearby attractions is a breeze with the area shuttle (surcharge). Featured amenities include a business center, complimentary newspapers in the lobby, and dry cleaning/laundry services. This lodge has 10 meeting rooms available for events. A roundtrip airport shuttle is provided for a surcharge (available 24 hours), and free self parking is available onsite. Make yourself at home in one of the 73 guestrooms featuring refrigerators and minibars (stocked with some free items). Complimentary wireless Internet access keeps you connected, and satellite programming is available for your entertainment. Private bathrooms with separate bathtubs and showers feature deep soaking bathtubs and complimentary toiletries. Conveniences include phones, as well as safes and desks. lastminute.com has a fantastic range of hotels in Centurion, with everything from cheap hotels to luxurious five star accommodation available. We like to live up to our last minute name so remember you can book any one of our excellent Centurion hotels up until midnight and stay the same night.